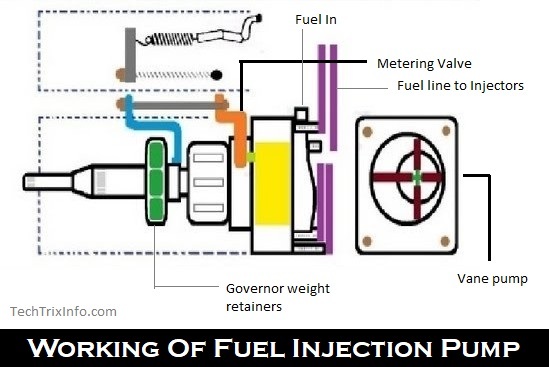 In this article, we will learn how fuel injection pump works in detail. The internal working will be explained here with the help of animation. Let’s see how fuel injection pump works. This is a rotor type fuel injection pump as shown in this video animation. All the above components are marked in the figure. There are three views of the fuel injection pump shown. The drive from the engine is driving the drive shaft of the fuel injection pump. You can see the governor weight retainer is mounted in the drive shaft. So as the drive reached the drive shaft, it starts to rotate. This will, in turn, result in the rotation of the governor. The governor controls the metering valve through the connection as shown in the video and figure. The metering valve connected to the vane pump through an internal gallery. When the vane pump rotated, it generates a flow of fuel and its pumped to the injectors. There are two factors which control the flow of the fuel. 1. The RPM of the engine. 2. The fuel demand created when the driver pressed the throttle. So depending on the RPM of the engine the engine need to control the fuel supply. With increased RPM more fuel is required and will less RPM less fuel. While driving when the RPM increase it reflects on the fuel injection pump drive shaft also. This will influence the movement of the governor weight retainers. With more RPM governor weight retainers moves backward pulling the metering valve. With less RPM governor weight retainers moves forward pushing it. This movement will vary the flow of fuel into the injectors. As the metering valve controls the flow. When the driver pressed the throttle for more power. The throttle moves, and this will also result in the movement of the metering valve. So as mentioned above the same happens. So this is how a roto type fuel injection pump works. If this article was useful. Please share it on social media. If you have any doubt, please drop a comment, and we will get back to you. WhatsApp @ +919744615655 for automotive technical updates from us. Previous WhatsApp group for mechanical engineers and automotive engineers. Next Why diesel cars have 25% more mileage over petrol cars.